There are mainly 3 layers in reinforced thermoplastic pipes. This layer is not load bearing but engineered to protect the FRP pipe against outside influences like sands and stones. This cover layer made of HDPE is additionally UV resistant. It’s strongly recommended that FRP pipes adopt continuous fiber as its reinforcement layer. Our customers often ask for HDPE coatings (GPE UD tapes) as the reinforcement of pipelines used to transport oil, gasoline, and propane. The non-metallic ingredients make it an ideal solution for serving extremely corrosive fluids in the toughest conditions. 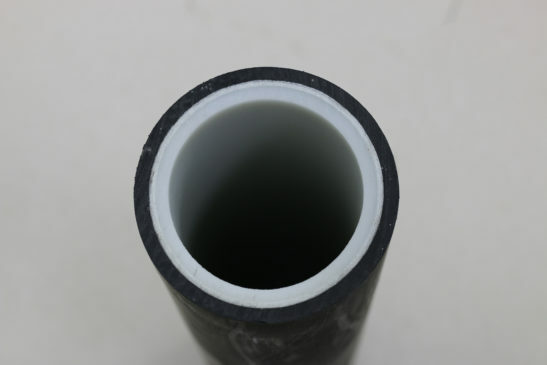 The liner is the very inner layer in the HDPE reinforced thermoplastic pipe. It can withstand all fluids and gasses in oil and gas applications. Due to the smooth inside surface, it is totally scaling free and has significantly less flow resistance than steel pipes. The liner is also 100% corrosion free and heat resistant. Click here to learn more about our materials for FRP pipelines. Please feel free to contact us at any time for more information about our CFRT (continuous fiber reinforced thermoplastic) materials and products. We are happy to discuss with you and find the best solution for your specific requirements.